The clouds have obscured much of the Apus (mountains) today. The rainy season is fully embracing the landscapes. 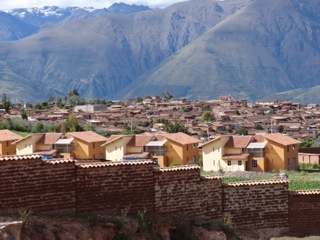 The shortage of water in Maras welcomes the water that flows from the skies to aid in what water cascades down the ancient and newly fashioned acequias that crisscross this Andean land. The maize that I planted with the Condori family in my first week here has now grown to well over two feet. Maize that fell to the soil behind the team of enormous Bulls that pulled the wooden plows across the rich Peruvian Earth. Pachamama (mother earth). Bulls connected as a team, twins that are echoed in the ceramic Torro (bulls) sculptures adorning almost every rooftop here. 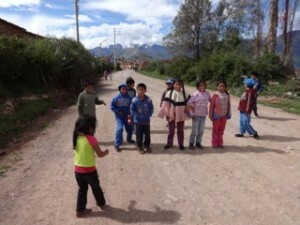 This afternoon, Joshuri and I walked and then skipped along the upper road on our way to buy gayettas (cookies) for the children for our second to last class of Escuela Bonita. We passed an elder woman dressed in the Maras convention; with her tall white hat and black band that rose above her long black twin braids. These braids so long that they reached well below her waist gathered together at the base with yarn (as is the fashion here) smiled at me having witnessed four year old Joshuri and I smiling and dancing along together. The woman smiled back at us in recognition of the bond Joshuri and I shared much like the braids that were wedded on her back. Joshuri and I reached the Bodega at the far end of this upper section of road. Twenty soles bought us savory chips that lit up Joshuri’s fresh young face. We added chocolate cookies, small hard candies and puffed corn. Once back at my casa, Joshuri drew on my notepad and every two minutes or so she asked “Professora Candida, quando es Escuela de ninos (school of the children)?” I smiled and relayed the time remaining in what seemed like two minute intervals. I showed her how to sketch the outline of her small manos by placing her small hand on the surface of paper and carefully following the outline of her hand with a pencil. She delighted in capturing her small hand’s outline. I offered her a yellow highlighter and she filled in the space of her outlined hand on papel (paper). In time, the moment had arrived to open the Puerto de la courtyard. Joshuri rose to the occasion and acted as the gatekeeper keeping the children at bay until 2:30 had arrived. She pulled the sticky red door ajar and some 20 children clamored into the courtyard replete with smiles and all the innocent enthusiasm that is their trademark. It was a special rainy day. We were to have a cinema in professora’s casa. I had pulled sheets and blankets across my living room windows, placed sofas next to one another and placed cushions and blankets across much of the room. My computer was poised to start the showing of the Legend of the Guardians, an animated film in espanol that commemorated the journey of young owls from their nest of their birth to the hollows of some evil Owls and beyond to reach the legendary Guardians…owls who were highly regarded. The film shared the young owls’ development of flight and escape from evil and adventure out across the ocean to reach the rocky island of the Guardians. Once the film ended, a documentary about owls followed, intended for a youthful audience. It spoke of the owls heightened sense of sight and hearing and their ability to turn their heads 190 degrees in either direction. Various ornithologists and owl lovers spoke of the necessity to protect the habitat of the owl. Jungles and forests felled had lead to threatened habitats for a multitude of owls. The children were riveted. The documentary complete, I pulled out the partial owl wing that I had found on the unpaved portion of the Maras main road that heads out of town passing fields of papas (potatoes) and maize. The children felt the soft, velvety plumes. One or two grasped the feathers and rubbed them against their cheeks. In the end the children made their way out of my casa with their bolsas (bags) and unfinished treats. After class I marched out into the darkening streets and found Martiza, Joshuri’s mother, and several other neighborhood women playing a game of soccer. Joshuri sat raptured watching her mother clad in her bright purple sweat pants and matching top and blue down vest kicking and running across the cement field with a face full of Joy. I captured glances of faces I have come to know in this last stronghold of Peru, this pocket of authentic Peruvian life. As the last of the sun’s light sunk below the horizon I walked back into the compound full of sentimental recollection. These ninety or so days have passed and with it my heart and being have marinated in this life. 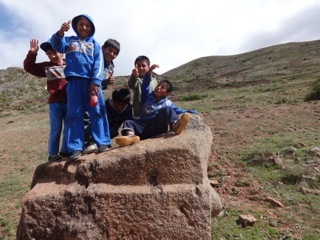 I walked to the rear of the property to the labyrinth that the children of escuela Bonita have fashioned with their chosen rocks and dreams. Each stone represented prayers, wishes, intentions that they blew three times into much like the maize seeds that I helped plant behind the teams of torros those many days ago. I sat and gazed at the pattern. Oso, poncho, and Oscar, my canine friends from the compound followed me to this sanctuary. Their tails wagged and they sauntered by my side. As I sat, I heard the sounds of Peru. Burros braying. The pueblo out on the cement still calling, laughing, cheering their fellow townspeople on, and then the winy, almost oriental sound of the music here. This is not the music of MTV, far from it. It held within it’s tradition. It held within it a hope for a future that still celebrates this unique brand of humanity. What have I taken from this time, this pacha? A clarity of being. An uncluttered thoughtful way of spending my days. Consumption is no longer propelling me as my native country had fashioned me. I don’t “need” as many things as I once thought. I don’t “need” to have a smart phone or a car or endless supplies of creams and toiletries or high fashion clothing. I don’t need central heating or even conventional firewood. A bolsa filled with the unraveling of ecalyptus bark that has fallen upon pachamama’s soil, a match and, some floridita water and my small tin oven and I can fashion all the heat I need on those errant cold, cold days where clouds obscure the sun’s rays and the high cool air takes hold. True too, I am coming to appreciate the quiet and the centering that comes with it. Stare out at the white crested mountains. Feel the sensations of being. Listen to what the heart is whispering. Breathe. What I revel in is the recollection of women standing, walking with wooden spools of yarn that they maneuver like a yoyo. The distant and majestic mountains with their glaciers gleaming white in all directions, the miles and miles of patchwork fields that are now glowing green. What I have found is that the call of the birds and the hills and the connection to warm and present people is what I do need, not the mounds of material things that the advertised world suggests. The photos and the journaling will be what is materially left of my time here. Yet it is what is in my heart and my memory that will remain branded to my soul. Siempre Peru esta en mia Corazon………….